Only the most important style properties, or style properties edited by you, are shown here. 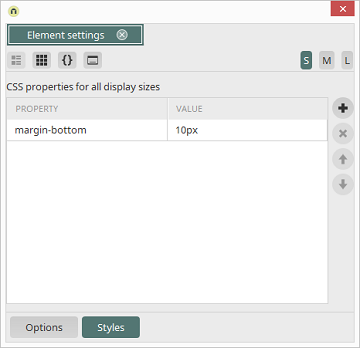 With the S, M and L buttons at the top right, you can define to which display sizes the CSS property applies. Adds a new, empty row to the bottom of the list. You can enter an available CSS rule here. Removes the property from the list. Modify the order of the properties.